Vice News and furries, the Fullerton murder story, and “sensational media”. Tempe O’Kun is a popular author of Paranormal Furry Romance, anthropomorphic-animal Westerns, and even game design. Tempe writes in to share his recent appearance in the news, plus Q&A with me. Things got physical at a town hall meeting this afternoon in Mandan with Rep. Kevin Cramer, R-N.D. Two people were escorted from the Coffee with Cramer event by police officers. Things got heated, when Cramer was accused of supporting tax cuts for the wealthy. Statement about the tragedy in Fullerton, CA. Please visit this GoFundMe campaign for expenses for surviving kids. There has been a lot of talk about a tragedy this weekend in Southern California. This is a niche interest, so when something like this happens, it’s personal tragedy to us beyond just a news story to others. Many members have lost friends or have very close ties to those who did. Please send thoughts to them, and the surviving kids most of all. I felt a little responsible for saying something, because of the way things started to happen when news started coming out. At first, it was just a call to locate a Missing Person (a fur) who was soon located. I tweeted that and got a high amount of views. When more came out, I looked into it deeply to write a big story. I talked to people close to it, with personal knowledge that nobody else had. Some info came out that was directed to the police. Then I saw people local to the story asking for space. They asked for it to be kept as their story, given time to process, and handled by professionals and cops. That was when I decided this is beyond fan level. I removed all my tweets and passed on their message. I think it really is the worst thing that ever happened with ties to this community. It’s not that unusual compared to other crimes that happen in cities, but I think it’s disproportionately big to a niche group. It might have to do with 2016’s explosion of interest and positive activity as well – things are just growing. That wasn’t quite the end of it. The OC Register reporter had a lot of conversation with me due to my initial notice. They were puzzled about what furries are and what they do. Of course they already knew this was part of the story – that wouldn’t be overlooked. It made a dilemma – I thought that if tabloids were going to exploit this, maybe a real member should say something to real news. So I sent the best info I could about the definition of “Furry” and referred the reporter to the same local person who I saw asking for space and respect. I thought he was already doing a good job of handling it. So when you see Bandit speaking in the piece, it’s not for attention, it’s because he was asked. Remember that he lost friends, like everyone else close to this story, and that’s the real deal. There were a few missteps from the OC Register piece (nobody said anything about “sensitive” topics,) but Bandit seems to be getting many thank-you’s for doing a good job from local members. He mentioned turning down other interviews, and I think that’s a good idea. Say it once and let it go. I have been checking around to see what comes out. I expect tabloids to try riding this, but most of the few I have seen so far seem pretty negligible, and I hope they get little mileage. They can say there’s weird stuff with misfit people, but nobody did a crime while participating in one of our activities. In the end it’s just between regular humans. TL;DR: Was going to write a big report. Stopped to let locals and pros process. I think it’s beyond fan level. It’s awful and sad. There hasn’t been anything this bad in fandom before. Let it process and share good words to anyone who lost friends and family. Thank you to the OC Register and reporter Scott Schwebke for linking here. And thank you to Scott for being professional and sensitive, and doing good detective work. I believe that Scott’s reporting has helped to stop rumors and confusion. There was a screenshot of a supposed murder confession that was degraded enough that you could see it was shared hundreds or thousands of times, before it was posted out-of-context on some trashy tabloid blogs. Scott dug up the source and provided context that I think shows it could NOT have been a reasonable clue of real danger before the incident. Thank you to everyone in the community who stepped up to provide such info to aid police investigation. Everyone’s concern will help heal this incident to heal in time. Everyone knows the FurFest chlorine story – but did you see Tommy Bruce’s documentary blog? Midwest FurFest was hit by poisonous gas. I rushed out a short notice, and had tips sent in by friends like Mordi. Soon, the news was everywhere. Do you like links and stories to come? Snausages– a regularish feature. Story tips welcome- I’d love to post yours! Amazing photos! Rough translating indicates that trouble in Ukraine led to a new event in a new location. Some of the same furries appear in this parade: Dreamflash… 5000+ people parading for hugs, positivity, bright costumes, and soap bubbles. A super cool answer to my older article, “Questions for Russian furry fans about anti-gay oppression“. Could simply wearing a fursuit get you in trouble? Not for these. 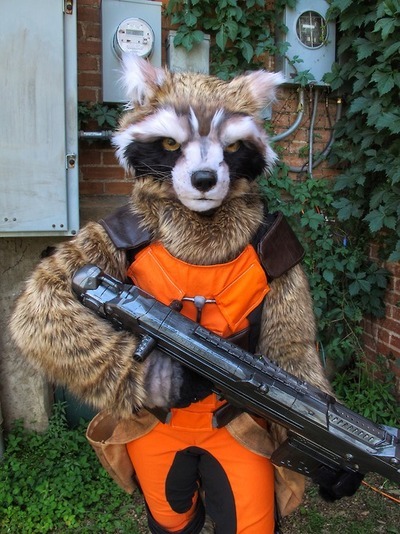 Furry culture in San Francisco news – Furfling banned on FA – Fur Con reg open, hotel 5/21 – Rocket Raccoon cosplay – And more! Do you like links and samples of stories to come? Here’s treats of the week. Snausages: now a regular feature!